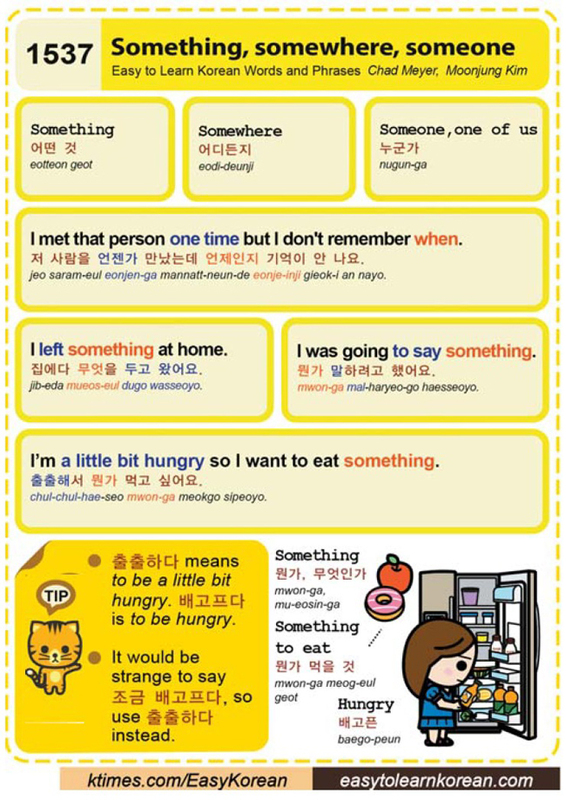 Easy to Learn Korean 1537 – Something, somewhere, someone. This entry was posted in Series and tagged eat, hungry, I left something at home., I met that person at one time but I don't remember when., I was going to say something., I’m a little bit hungry so I want to eat something., one of us, someone, something, something to eat, somewhere, to be a little bit hungry, to be hungry, 누군가, 무엇인가, 뭔가, 뭔가 말하려고 했어요., 뭔가 먹을 것, 배고프다, 배고픈, 어디든지, 어떤 것, 저 사람을 언젠가 만났는데 언제인지 기억이 안 나요., 조금 배고프다, 집에다 무엇을 두고 왔어요., 출출하다, 출출해서 뭔가 먹고 싶어요. by easykorean. Bookmark the permalink.